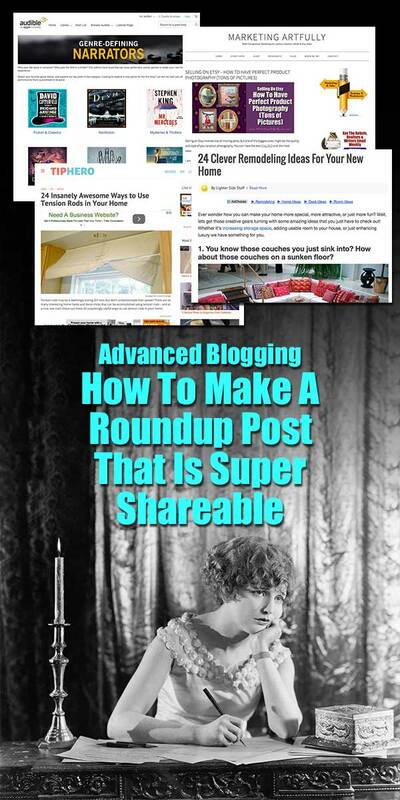 Today’s post is about advanced blogging and how to make a roundup post that is super sharable on social media sites. If you are thinking about kicking your blogging up to the the advanced level (like a post a day), the first thing that comes to mind is, “how I am going to produce all that content?” At least that is what happened to me when I decided that I was going to write a post a day on three of my different blogs (3 for Marketing Artfully a week, 2 for Glamorously Vintage a week and 2 for Paperly People a week). One way that I am really researching now are roundup posts. These are posts were you gather a bunch of different related ideas and put them together in a post that you are curating rather than creating. Curating here means that you are not trying to make 24 pictures and you are not using 24 of your own blog posts. 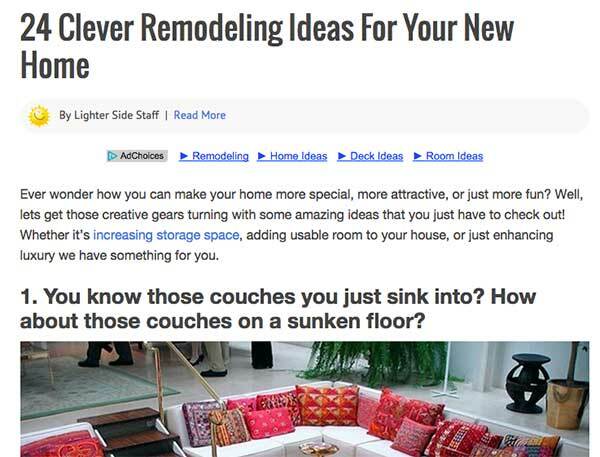 Instead you are creating a topic like “Remodeling Ideas For Your New Home” and then finding posts with great pictures that you will share in it. I always make sure that the original source of the content is clear. For example, this time I am feature the blog that did the roundup, but if I was going to share it a different way I would try to find the people who posted the original content. In this case it would be the sites that they had referenced. I always make sure that the picture links to their post. This means that I am sending traffic away from my site, but I use the target=”_blank” tag in the image so that it pops up a new window. I always also include a text link under the image (as I did there) to show the source of the content. Super advanced… I also make sure to use the rel=”nofollow” tags in all but one of the links. If you want to learn why, check out the exact answer from Matt Cutts of Google. Basically if you are super careful and working in integrity, you will probably not get in trouble by using another post’s content. That said, please do not copy a post in its entirety and put it on your website. This WILL cause duplicate content problems for you or them in Google. Instead you should include your comments about the content of that post in your roundup and leave them to say what they have to say on their site. What Niches Does This Work For? I was a little hesitant to think that this would work for me. I had a feeling that I could do something like this on my product photography for bloggers site, but how would a “normal” business go about doing something like this? Mostly I had seen these types of posts do really well on Pinterest, but how did that translate into a way for me to use this kind of idea. 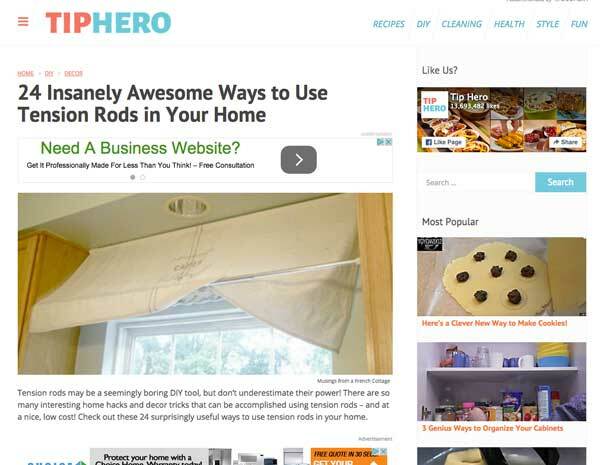 In this post they just went around the internet and found pictures and posts where people had used tension rods in different ways and then made a huge post where they referenced them all in one place. Then they shared each of the pictures on Pinterest separately, appealing to a HUGE range of people from home office decorate-y types like me to Moms who wanted to organize their kids toys. This is such a super compelling idea of a way to create content. You are helping other people AND creating an asset on your website that is sharable and compelling. but somewhere along the line I missed the part where you share all those pictures on Pinterest also, making a huge web of people who are going to find you in random ways. Note: One thing about this is that it will probably raise your views and increase your bounce rate. 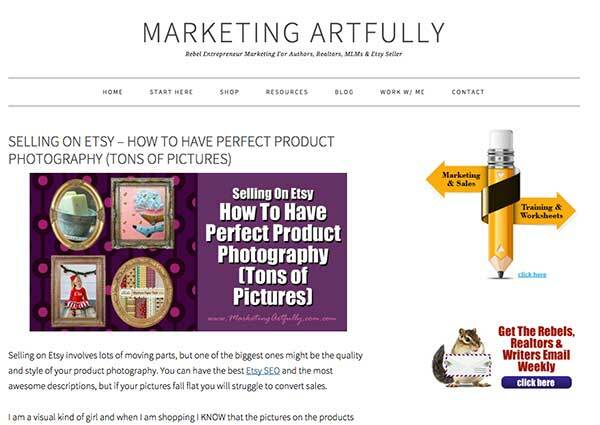 Getting traffic is great, but if they are coming to my site to see products for sale from those people, they will probably hit my site and go right off to their Etsy store. Not necessarily a bad thing if I am just trying to increase traffic but a terrible thing if I am trying to create an authority site to sell my marketing “stuff”. You really need to know what your goal is so you can share accordingly! So Why Did I Start Thinking That This Would Work For Business? I guess I really always thought that the main things these were used for was Business To Consumers (B2C). Cute office spaces, tension rods, freezer meals you could make in a minute. 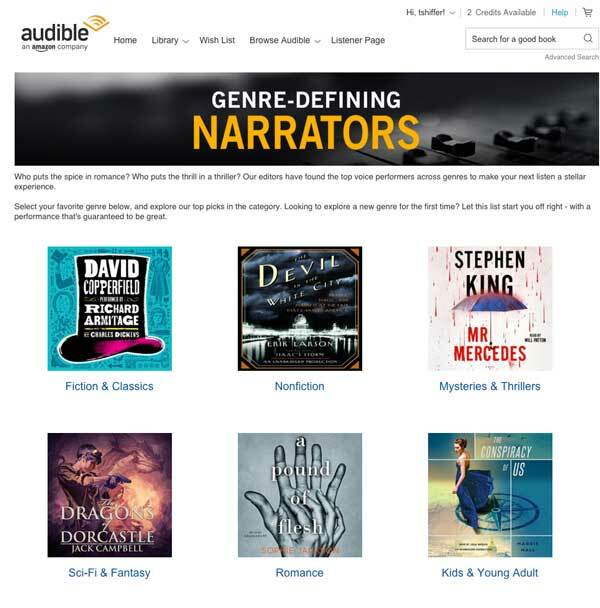 But then… wah, wah … Audible sent me a really cool link where they weren’t trying to sell Audiobooks, they were “introducing” new narrators. Hmmm, now that seems interesting, like a twist. NOT selling books but focusing on some sideways kind of thing to get them to buy. Oh this hooked me in so many ways. I am a huge Audio book listener, PLUS they had book covers, PLUS it was a really cool way to find books to read just because I like the narrator. Over time, people have sent me great examples of roundup posts! 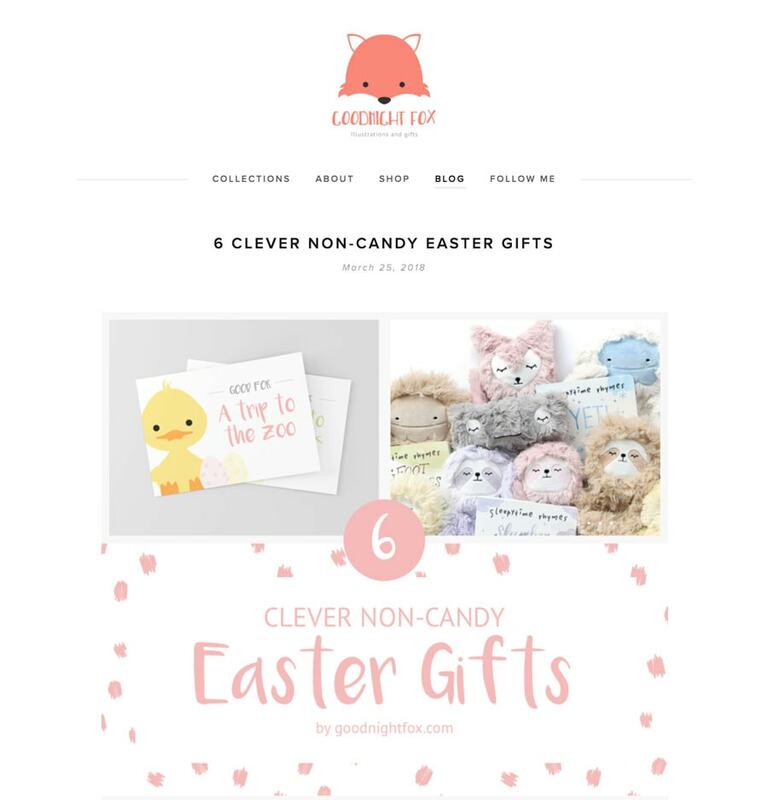 I will start collecting them here to share them with you starting with this one about non candy Easter ideas from goodnightfox.com. Whoa, this post has helped so much…here are a couple of things that have worked for me about doing these roundups! Email the people who you included in the post letting them know you shared their content. No one has EVER asked me to take anything down and many of them have shared the post on their socials. Have multiple images to share. These are viral posts so you don’t want to look like a schmoe sharing the same thing over and over again. Make sure you make a tall Pinterest graphic to share. 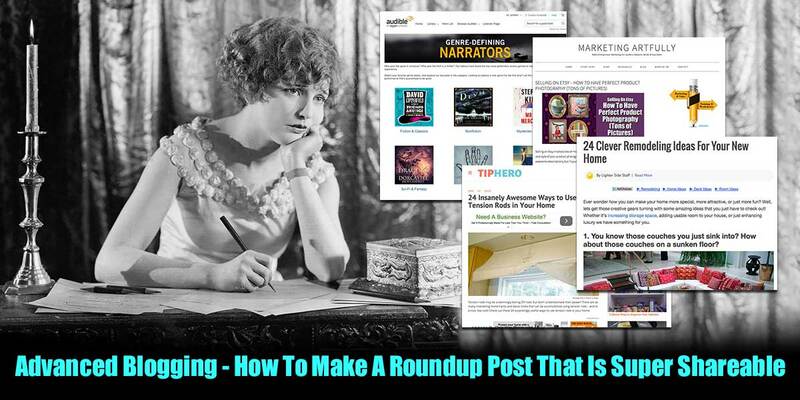 Pinterest people LOVE roundups and you can get some great traffic that way! Huge list of roundup posts that is a great reference list!